Let Us Create A Sign For You! 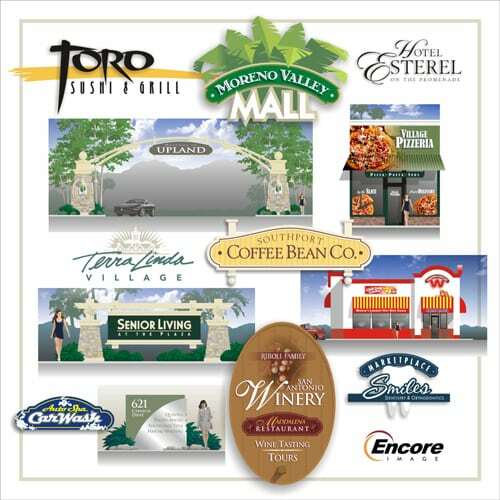 Encore Image creates custom architectural signs and sign structure elements. We have a long history of producing superior sign systems. However, Encore Image also believes that an effective visual image is the total of all the elements that comprise a corporate or retail establishment. Signs, lighting, architectural features and landscaping all work together to create a compelling visual identity. Using these components, it is our mission to work with discerning clients to help them design, build, and maintain memorable visual identities. We seek out companies with one-location as well as international firms, realizing that both have many of the same needs and deserve the same elevated level of attention that is required for lasting relationships. Let Encore Image Create A Sign For You!